I recently saw part of To Catch a Thief on TV. I remember thinking it was good, but not great. What a difference a DVD packed with extra features can make! To Catch a Thief was made by Alfred Hitchcock near the peak of his career in 1955. It had two of his favorite stars: Cary Grant and Grace Kelly. It was filmed in one of his favorite places: the French Riviera. Grant plays John Robie who thieved for the French resistance during the war. A recent spate of burglaries casts suspicion on him, so he sets out to catch the real cat burglar to clear his name. He crosses the path of Francie Stevens (Grace Kelly), the daughter of an American heiress, one of the people in the neighborhood with something worth stealing. Francie falls for Robie and sets out to catch her own thief. See To Catch a Thief on TV and you, too, might be unimpressed. Hitchcock has been a favorite for American audiences for so long that we take his work for granted. It’s tame enough for TV. 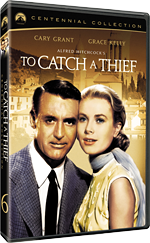 But watch it on DVD — maybe even on this Centennial Collection DVD — and you’ll come to appreciate just how good To Catch a Thief really is. For starters, the film was one of the first shot in VistaVision, an early ancestor to today’s IMAX format. Coupled with the photogenic locations in southern France, the film becomes a travelogue on top of a suspenseful romantic mystery. The film offered stereophonic sound, too, which, though not as much of a novelty, was still an impressive leap over what you would have gotten from your TV in 1955 (which was exactly the point for Paramount). This is a movie you want to see on a good screen and with good equipment. Additionally, some of the extra features are very good. Smart and well-connected people frame the film. They call out details and factoids that explain just how ahead-of-its-time To Catch a Thief was. There is a whole disc of extra features, along with an audio commentary on the first disc. Most of this material is much more informative than your standard DVD fare. Start with the audio commentary by Dr. Drew Casper, who holds the Hitchcock chair at USC. Casper is well prepared; when a new scene is about to come up, he’ll shift gears to make sure we don’t miss the transition. More importantly, he has interesting things to say about the story, the context, and Hitchcock. For example, he points out that the story structure is recursive. The overall story is about Robie trying to catch the cat burglar. But the subplots are also about a person trying to catch someone (Francie trying to catch Robie, the insurance inspector trying to catch the real thief), and so are several of the individual scenes (the flower market, the car chases, the picnic scene). One could make the case that “chasing someone” is vague enough that it’s meaningless, but Casper implies that Hitchcock and screenwriter John Michael Hayes actually worked this way, with the smaller scenes repeating the overarching theme. Or take the two brief and unimportant shots of an egg yolk being abused. Casper tells us that Hitchcock, something of a gourmet, could not stand the sight of an egg yolk, thus the tiny little cinematic jabs. Most of the featurettes on disc 2 are worth watching. Unacceptable: Under the code in Hollywood repeats some of what Casper said in the audio commentary about the risqué nature of some of the scenes. This facet is yet another example of why seeing To Catch a Thief on DVD is better than seeing on TV: flipping past Grant and Kelly, you won’t realize just how hard Hitchcock fought to keep the sexuality — tame by modern standards — in the film. An Appreciation features interviews with the Hitchcock family. Some of the best stories come from Hitch’s granddaughter who studied him in one of her college courses. She remembers asking whether all these scholarly theories about his work were true (no). And the paper he helped her write on “Hitchcock’s Favorite Film” earned a C.
Skippable features include Writing and Casting and The Making Of (which includes some interviews that have to do with the making of the film, and some that don’t). There is also an interactive feature on the locations in the film, stills galleries, and a featurette on Edith Head that looks like the same one that’s on the Sunset Blvd.disc. Considering how easily I dismissed it when I saw it on TV, I recommend you start by watching one of the extra features to get yourself in the right frame of mind. Maybe the featurette on the Hayes code or ten minutes of the audio commentary will increase your expectations and get you thinking about 1955. Bask in the picture quality and the stunning French seaside. If you’ve seen the film already, just watch the whole thing with the audio commentary and learn why To Catch a Thief is better than you might think. If you decide you like the extras on The Centennial Collection, then expand your horizons when you’re done with the DVD. I had professors who respected but disliked Hitchcock and had interesting things to say about his life and work. Their views won’t be given space on a studio-backed DVD release. I’m not trying to intimate anything; it’s just that the scholarship on this DVD is a very good start, and it only scratches the surface.